The film was co-commissioned by 14-18 NOW and Imperial War Museums in association with the BBC, who approached Jackson in 2015 for the project. According to Jackson, the crew of They Shall Not Grow Old reviewed 600 hours of interviews from the BBC and the IWM, and 100 hours of original film footage from the IWM to make the film. The interviews came from 200 veterans, with the audio from 120 of them being used in the film. After receiving the footage, Jackson decided that the movie would not feature traditional narration and that it would instead only feature audio excerpts of the soldiers talking about their war memories, in order to make the film about the soldiers themselves; for the same reason, it barely features any dates or named locations. "This is not a story of the First World War, it is not a historical story, it may not even be entirely accurate but it's the memories of the men who fought - they're just giving their impressions of what it was like to be a soldier." —Peter Jackson at the film's premiere. Jackson stated: "We made a decision not to identify the soldiers as the film happened. There were so many of them that names would be popping up on the screen every time a voice appeared. In a way it became an anonymous and agnostic film. We also edited out any references to dates and places, because I didn’t want the movie to be about this day here or that day there. There’s hundreds of books about all that stuff. I wanted the film to be a human experience and be agnostic in that way. [...] I didn’t want individual stories about individuals. I wanted it to be what it ended up being: 120 men telling a single story. Which is: what was it like to be a British soldier on the western front?" In another interview, he stated "[The men] saw a war in colour, they certainly didn’t see it in black and white. I wanted to reach through the fog of time and pull these men into the modern world, so they can regain their humanity once more – rather than be seen only as Charlie Chaplin-type figures in the vintage archive film." Jackson's own paternal grandfather, Sgt. William Jackson, to whom the film is dedicated, was British and fought in World War I; Peter grew up with his father telling him his grandfather's war stories. Jackson stated that after making the film, he now had "a greater understanding of what my grandfather would have gone through". Jackson did not receive any fee for the making of the film. Although only a small part of it was used, Jackson's crew visually restored all 100 hours of footage the Imperial War Museums sent them for free, "just to get their archive in better shape". It was produced by WingNut Films with House Productions as executive producers and was supported by the UK's National Lottery through the Heritage Lottery Fund and the Department for Digital, Culture, Media and Sport. The music was composed by New Zealand trio Plan 9, consisting of David Donaldson, Steve Roche and Janet Roddick. The closing credits of the film feature an extended version of the song "Mademoiselle from Armentières", which was particularly popular during the war. Jackson decided late in the production to use the song and there was little time to assemble the performers. Rather than have non-British men try to sing in British accents, native speakers in service to the UK government were recruited from the British High Commission in New Zealand. The film premiered on 16 October 2018 as a Special Presentation at the BFI London Film Festival, in the presence of Prince William, Duke of Cambridge, while also being released in several selected theaters across the country; copies were also sent to UK schools the same day. The film was simultaneously screened in 2D and 3D at cinemas, schools and special venues across the UK. The simulcast included a special post-screening Q&A with Jackson, hosted by film critic Mark Kermode. The film was broadcast on BBC Two on 11 November 2018, the one-hundredth anniversary of the Armistice of 11 November 1918. To accompany the film, a special episode of the documentary series What Do Artists Do All Day? which followed Peter Jackson making the film aired the following day on BBC Four. The film received a special United States release through Fathom Events in 2D and 3D, on 17 and 27 December 2018. Warner Bros. will launch a theatrical release in New York, Los Angeles, and Washington, DC, on 11 January 2019 and plans to expand to 25 markets on 1 February. Because it missed the 1 October 2018 filing deadline, the film was deemed ineligible for consideration for the Academy Award for Best Documentary Feature at the 91st Academy Awards; because it is still a 2018 film, it will also be ineligible for the ceremony the following year. They Shall Not Grow Old has grossed $17.9 million in the United States and Canada, and $1.7 million in other territories, for a total worldwide gross of $19.6 million. In the United States, the film was screened as part of a one-day presentation through Fathom Events on December 17, 2018 and grossed $2.3 million, setting a record for a documentary showing through the company. Encore screenings were held on December 27, making $3.4 million from two showtimes at 1,122 theaters. It was the highest-grossing single-day total ever for a documentary playing via Fathom, and one of the top-grossing single-day presentations of any kind from the company. On Martin Luther King Jr. Day, the film grossed an additional $2.6 million from 1,335 theaters. The film had a general release in 735 theaters on February 1, 2019 and made $2.4 million, finishing 10th. On review aggregator Rotten Tomatoes, the film holds an approval rating of 100% based on 124 reviews, with an average rating of 8.66/10. The website's critical consensus reads, "An impressive technical achievement with a walloping emotional impact, They Shall Not Grow Old pays brilliant cinematic tribute to the sacrifice of a generation." On Metacritic, which assigns a normalized rating based on reviews, the film has a weighted average score of 91 out of 100, based on 26 critics, indicating "universal acclaim". Giving the film a perfect five-star rating, Peter Bradshaw in his review for The Guardian called the film "a visually staggering thought experiment", saying "The effect is electrifying. The soldiers are returned to an eerie, hyperreal kind of life in front of our eyes, like ghosts or figures summoned up in a seance. The faces are unforgettable. [...] The details are harrowing, as is the political incorrectness of what the soldiers recall: some express their candid enjoyment of the war, others their utter desensitisation to what they experienced." Guy Lode of Variety called the film "a technical dazzler with a surprisingly humane streak", stating "if They Shall Not Grow Old is head-spinning for its jolting animation of creakily shot battle scenes — tricked out with ingeniously integrated sound editing and seamlessly retimed from 13 frames a second to 24 — its greatest revelation isn’t one of sound and fury. Rather, it’s the film’s faces that stick longest in the mind. Through the exhaustive transformation completed by Jackson’s team, visages that were all but indistinguishably blurred in the archives take on shape, character and creases of worry, terror and occasional hilarity. In conjunction with the film’s intricately stitched narration, its soldiers turn from cold statistics to warm, quivering human beings, drawing us with renewed empathy into a Great War that, they all but unanimously agree, had precious little greatness to it." Stephen Dalton of The Hollywood Reporter stated that the film "suggests new cinematic methods of rescuing history from history books, humanizing and dramatizing true stories with a modest injection of movie-world artifice. Some critics may object to how Jackson streamlines and elides real events, stripping away specifics while offering no broader socio-political comment on the war. But as a immersive primer on the first-hand experiences of British soldiers, this innovative documentary is a haunting, moving and consistently engaging lesson in how to bring the past vividly alive." Mike McCahill of IndieWire gave the film a B grade, considering that "the filmmaker's extensive restoration project doesn't always provide new insights, but it succeeds at creating a fresh look at the horrors of WWI." ^ a b "They Shall Not Grow Old (2018) - Financial Information". The Numbers. Retrieved 23 April 2019. 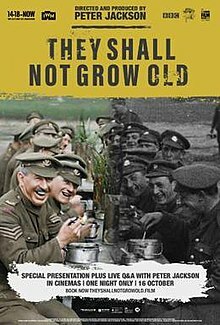 ^ "They Shall Not Grow Old (2018) - Box Office Mojo". Box Office Mojo. Retrieved 7 April 2019. ^ a b McNary, Dave (27 December 2018). "Film News Roundup: Peter Jackson's 'They Shall Not Grow Old' Sets Record With $3.4 Million". Variety. Retrieved 29 December 2018. ^ a b "THEY SHALL NOT GROW OLD – Special interview with director Peter Jackson". 3aw. 11 November 2018. Retrieved 12 November 2018. ^ a b "'You tried to get me in an ORC suit' Prince William jokes with director Peter Jackson". Express. 16 October 2018. Retrieved 12 November 2018. ^ a b c d "Peter Jackson interview: how I made the visually stunning They Shall Not Grow Old". Flicks. 10 November 2018. Retrieved 12 November 2018. ^ "'You tried to get me in an ORC suit' Prince William jokes with director Peter Jackson". 16 October 2018. Retrieved 16 October 2018. ^ a b c "Prince William attends World Premiere of "They Shall Not Grow Old"". Royal Central. 18 October 2018. Retrieved 12 November 2018. ^ ""There was no feeling sorry for themselves": Director Peter Jackson on the soldiers of the First World War". History Extra. 7 November 2018. Retrieved 12 November 2018. ^ a b c "Peter Jackson They Shall Not Grow Old". Imperial War Museums. Retrieved 16 October 2018. ^ "They Shall Not Grow Old". Retrieved 16 October 2018 – via www.imdb.com. ^ Halligan, Fionnulafa (16 October 2018). "'They Shall Not Grow Old': London Review". Screen Daily. Retrieved 14 November 2018. ^ Bradshaw, Peter (16 October 2018). "They Shall Not Grow Old review – Peter Jackson's electrifying journey into the first world war trenches". the Guardian. Retrieved 16 October 2018. ^ "BBC Two – They Shall Not Grow Old". BBC Programmes. Retrieved 11 November 2018. ^ "BBC Four – What Do Artists Do All Day? – Peter Jackson". BBC Programmes. Retrieved 17 November 2018. ^ "Fathom Events - They Shall Not Grow Old". Fathom Events. Retrieved 17 December 2018. ^ a b D'Alessandro, Anthony (27 December 2018). "Peter Jackson's WWI Doc 'They Shall Not Grow Old' Sets Brand New Fathom Events B.O. Record With $3M+, $5M+ To Date". Deadline Hollywood. Retrieved 27 December 2018. ^ "Peter Jackson's WWI Doc 'They Shall Not Grow Old' Breaks Fathom Events B.O. Records With $2.3M". Deadline Hollywood. Retrieved December 18, 2018. ^ McNary, Dave; McNary, Dave (25 January 2019). "Film News Roundup: Peter Jackson's 'They Shall Not Grow Old' Pulls in $2.6 Million on MLK Day". ^ D'Alessandro, Anthony (February 3, 2018). "'Glass' Still Has Class With Third Weekend Win; 'Miss Bala' Fires Blanks In Lowest Super Bowl Frame In 19 Years – Sunday Final". Deadline Hollywood. Retrieved February 3, 2019. ^ "They Shall Not Grow Old (2018)". Rotten Tomatoes. Retrieved 11 March 2019. ^ "They Shall Not Grow Old reviews". Metacritic. Retrieved 11 March 2019. ^ Lodge, Guy (16 October 2018). "Film Review: 'They Shall Not Grow Old'". Variety. Retrieved 13 November 2018. ^ Dalton, Stephen (16 October 2018). "'They Shall Not Grow Old': Film Review". The Hollywood Reporter. Retrieved 16 October 2018. ^ McCahill, Mike (16 October 2018). "'They Shall Not Grow Old' Review: Peter Jackson's Colorized WWI Documentary Resurrects the Drama of the Battlefield". Indiewire. Retrieved 13 November 2018. This page was last edited on 24 April 2019, at 04:45 (UTC).